Reinvent your home décor with these easy-to-create stool covers. The suggested yarn is unique t-shirt yarn is made from recycled factory off-cuts so you can add pops of color to your home and feel good about it all around! 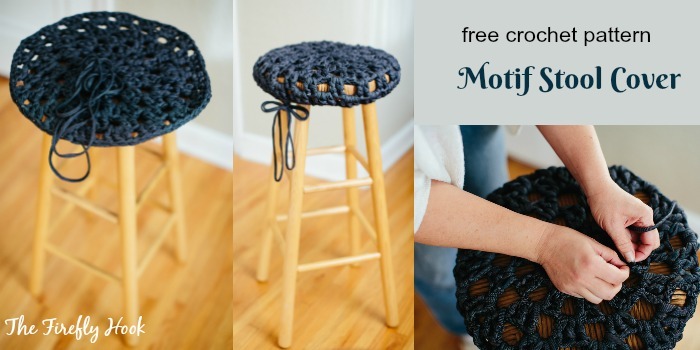 This free crochet stool cover pattern is brought to you by our guest, Abbey from The Firefly Hook. - Wool and the Gang Jersey Be Good fabric yarn, 98% cotton 2% elastane, 100 meters (109 yards) per 500-gram roll: One roll for 12” stool cover. Rnd 6: Rep rnd 5. Finish off leaving a 24” tail. Weave tail around rnd 7 and cinch around stool. Tie a bow, or weave in ends. Many thanks to Abbey for sharing this pattern with our readers! 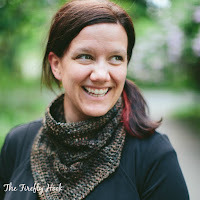 The Dogwood Cowl - Free Crochet Pattern! For more beautiful patterns, please visit Abbey's Blog - The Firefly Hook and her Ravelry Page. You can also find Abbey on Facebook, Instagram and Pinterest. Drawing inspiration from the artistry of everyday life, crochet teacher and designer Abbey Swanson of the Firefly Hook creates patterns that mirror the intricacies and grandeur of all the things that she loves best: from wildflowers to skyscrapers. The architecture of her designs often honors a particular geographical or cultural moment. Her mission is to motivate a new generation of crocheters with a new and fresh reputation for crochet. Don't miss out new free crochet patterns, tutorials and other updates from My Hobby is Crochet! Subscribe to the Free Newsletter and follow My Hobby is Crochet on Facebook, Pinterest, Bloglovin, Google+, Instagram and Twitter.